After a long wait, with people being sick of the hot weather and farmers getting too stressed and worried about their crops; finally the monsoon is here! But everything is not going to be cool and breezy in the rainy season. With the monsoon comes along diseases and infections like food poisoning, cholera, typhoid, and more. 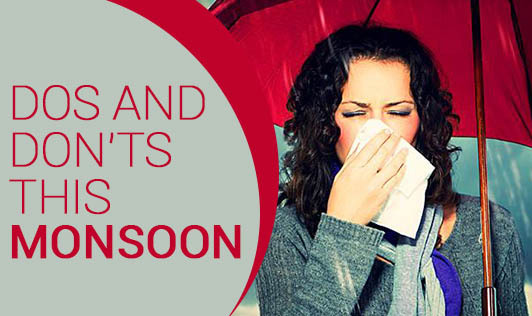 The monsoon rains moderate the climate and aid in the growth of bacteria and germs. People with low immunity and people already struggling with illness should be more cautious. Here are a few simple tips that will help you be healthy and strong through the monsoon. What not to do this monsoon? • Avoid getting wet in the rain. If at all you do get wet, dry yourself as quickly as you can. It would be best to be carrying an umbrella everyday to work and keep a set of dry clothes at office, so you can change immediately. • Avoid wearing damp or dirty clothes. As the climatic condition supports the growth of germs and fungi, skin and other infections are at peak in this season. • Avoid eating at street stalls that sell chats, samosas, and jalebis. Due to rains the sewage system will get clogged and the road-side vendors do not practice hygiene efficiently. Hence buying food from them should be avoided at all costs. • Avoid the intake of junk, salty, and heavy foods like fish and meat as it may lead to swelling, inflammation, and gastric disorders. • Avoid the consumption of salads and cut fruits while eating outside food because of increased chances of germs in them. • Avoid the consumption of dairy products like buttermilk, cottage cheese, and raita while eating outside food. What to do this monsoon? • Eat a lot of green vegetables. Fruits and vegetables should be thoroughly cleaned and consumed as soon as they are cut. Vegetable help improve your immunity and help fight against infections. • Eat dry foods like corn, roasted peanuts, or channa for snacks. These are nutritious and high in protein content. They would take care of your cravings and nourish you as well. • Consume steamed salads as eating raw salads may be dangerous to health. • Use ingredients that increase your immunity like ginger, garlic, onions, jeera, and turmeric. • Having a teaspoon of honey daily during this season helps to improve digestion as it acts as a catalyst and keeps the intestines sterile. • Enjoy warm beverages like tea, coffee, and green tea with added ingredients like ginger and lemon which would help fight germs.